My latest two layouts are seem to have very different topics, but when looking back at them, I realize they both tell a story about unexpected finds. First, is a layout of Kevin and Reese. What's the find? Being reminded of my two youngest sisters around the age Kevin is in these photos playing with Blake when he was a baby. Then it hit me, the age difference between my youngest sister and Blake is the same as that of Kevin and Reese. On Thanksgiving, I loved watching Kevin in the floor playing with Reese and sharing the toy tractors with her. (And aren't her curls just adorable?) 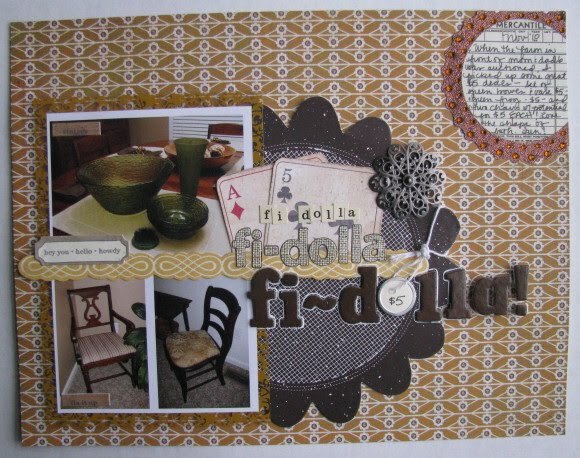 I used my "Dear Diary" (Nov. '10) kit from Noel Mignon for this layout. I added the American Crafts crocheted flowers and the yellow Basic Grey alpha stickers. My boys don't have as many first cousins as I did (50 or so...), but the bonds they share with the ones they do have I hope will be stronger. I used the same "Dear Diary" kit for my next layout. I thought the papers fit my topic perfectly. In November I attended an auction on the property next to my parents' farm. I didn't go to buy anything, but ended up spending $20. I spent $5 on each sale and my title mocks an auctioneer, "Fi-dolla, fi-dolla, who'll give me fi-dollas???" When I saw a green floral frog on a table, I knew I was going to make a purchase. Then they grouped it together with a bunch of stuff I didn't want, and the bidding went over $10. I approached the winning bidder and gave her $5 cash for the frog. There were a few green dishes on my wish list, too. They went over my $10 limit. I figured I had nothing to lose, so I approached that winning bidder, too. One of the green bowls what the only thing she had wanted and she said it was actually valuable. She sold the large green salad bowl and 3 matching smaller ones to me for $5. Later, she came by and gave me a green vase, too. Then I saw the chairs. I actually needed an extra one in our formal dining room. I had my sights on two, hoping to get one of them. They went late in the auction and the crowd was dwindling. They started the bidding high on both and no one would bid. I offered $5 (both times) and no one bid against me. The one with arms looks great in our dining room. I just need to recover the seat. The smaller one has a great shape and is just cute sitting in a corner in our living room. I liked the scalloped shape of the packaging that came with my Jillibean Soup corrgated shapes, so I used it on my layout. I also added a tag and bling frame (around my journaling). Although I had fun at the auction, I haven't been to one since. I don't "need" anything and am afraid I'd bring home too many deals! Fun to see that you documented your auction items.